Brooke Coleman of Texas A&M University won the second annual WEF Collegiate Equitation Championship. © Sportfot, Official Sport Photographer of the FTI Winter Equestrian Festival, www.sportfot.com. Wellington, FL - February 11, 2011 - The 2011 FTI Winter Equestrian Festival (WEF) hosted the second annual Collegiate Equitation Championship today at the Palm Beach International Equestrian Center. Riders from 16 universities around the country gathered to compete in a head-to-head, bracket-style format. It was Brooke Coleman from Texas A&M University who claimed victory in the championship. Invitations were extended to 16 student athletes who currently participate in collegiate equestrian programs. They rode over fences in courses set at 3'6" designed by Bobby Murphy of Lexington, KY. The judges were Jimmy Torano and Ralph Caristo. The 16 riders were narrowed down earlier in the day to eight who competed under the lights in the International Arena tonight. Horses and tack were generously provided by area professionals. 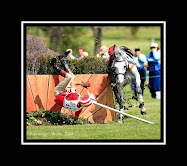 The riders were given a four minute warm-up in which they are allowed four fences. Three rounds were held in the International Arena this evening, and it came down to Coleman and last year's champion, Maggie McAlary (Auburn University), in the final bracket. Both riders completed the course on Striptease, a horse generously donated by Erica Belden and Emma Butchard. 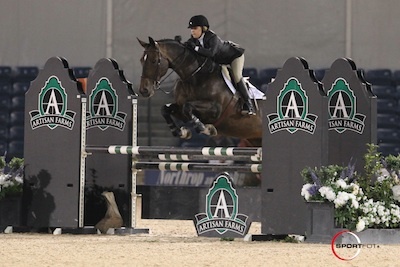 In the first round tonight, Coleman scored a 78 riding Near Darc, owned by Emily Hertz. In the second round, she piloted Michelle Grubb's Legitimo over a course that included a trot jump and a halt and scored 70. Coleman said of her first two trips, "My first round was really great. He was an awesome horse. He had a lot of scope and was fun. I thought it was a pretty solid round. On my next horse, it was a little more difficult. He was a little greener, and he's only six years old. It can be tough for them out here under the lights at night. But, it went well enough for me to move on to the last round." Riding Striptease in the third round, Coleman scored 75. Coleman also won the high score award from the opening rounds earlier in the day with an 82.5. McAlary had a strong showing for second place with scores of 82 and 85 in the first two rounds tonight, but with a mistake in the triple combination in the final round and a score of 65, she was awarded second place. "Maggie McAlary had an amazing round," Coleman said, "(and) it was unfortunate what happened to her in the combination. I had to go in and not have that mistake. I was almost out of energy, but we got it!" This was Coleman's first time at this event, but as a senior at Texas A&M, she is in her fourth year of riding for a team. Originally from Houston, TX, Coleman said coming to show at the FTI WEF "felt like coming home" after she spent her high school years here. "It was so much fun. I just had a blast. It was a great opportunity to come out here under the lights," she said. Of her victory, Coleman said, "It means a lot to win. I no longer think of myself as an individual rider. I felt like my whole team was here with me tonight, even though they're back in Texas. I was riding for them. I'm excited to go back and see them." Since Texas A&M has an NCAA competition this weekend, Coleman was here with student coach Lindsay Smith, who was on the team for four years. Smith said of the event, "It was run beautifully, and the fact that exhibitors here donated their horses was absolutely phenomenal. I think it's great for the program to get this exposure. It's been a great day; thank you to all of the sponsors." The other riders competing tonight were: Kimberly Budnik of Fresno State University, Kendra Vicary of Baylor University, Megan Violand of South Dakota State University, Jordyn Pettersen of Southern Methodist University, Victoria Lee of Texas Christian University, and Caroline Cramer of the University of Tennessee-Martin. In the consolation bracket for the eight riders who didn't make to the finals, the winner was Samantha Elser of Oklahoma State University. Elser originally hails from Hopewell Junction, NY. The other riders in this morning's rounds were: Abbie Britton, Nellie Foosaner, Laura Bostwick, Kim McCormack, Kacy Jenkins, Catherine Avolese, and Kayla Blair. Four alumni riders gave a flat demonstration, with Haylie Jayne Rolfe (University of Georgia) winning her bracket over Eleanor Kunsman (University of South Carolina). Kristen Terebesi (University of South Carolina) won the second bracket over Ally Blais (Oklahoma State University). Auburn University, Baylor University, Delaware State University, Fresno State University, Kansas State University, New Mexico State University, Oklahoma State University, Sacred Heart University, South Dakota State University, Southern Methodist University, Texas A&M University, Texas Christian University, University of Georgia, University of Miami, University of South Carolina, and University of Tennessee-Martin. In 1998, equestrian was classified as an NCAA emerging sport. Currently 23 colleges and universities offer equestrian as a varsity sport and more continue to add each year. Schools compete in a head to head format, where each team is required to ride the same set of horses. The host school provides the horses and tack at each competition. The format includes hunter seat equitation on the flat and over fences, western horsemanship, and reining. The United States Equestrian Federation, the national governing body for equestrian sports, in conjunction with the American Quarter Horse Association, have been influential in the development of the sport and its rules. The National Collegiate Athletic Association (NCAA) is a voluntary organization through which the nation's colleges and universitiies govern their athletics programs. It comprises more than 1,250 institutions, conferences, organizations, and individuals committed to the best interests, education, and athletics. The NCAA has strict rules and regulations regarding prospective students. Coaches can only contact a prospective student who is a junior or senior in high school. 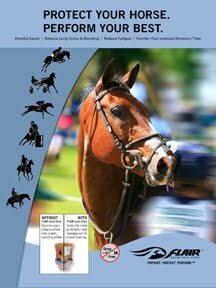 For more information, please visit www.varsityequestrian.com.